Don't miss out on another hot deal! Get our newsletter! 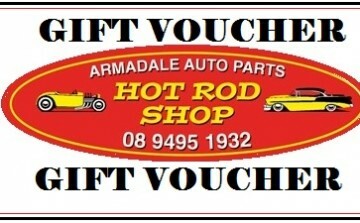 Armadale auto parts have been supplying gift vouchers for many years. They’re the perfect option for someone if you don’t know their shirt size or design or colour preference, or maybe they need a car part and you aren’t sure which bit they need. Grab a voucher, in store, on line, over the phone or even by email! We’ll do everything we can to make it easy for you to get it organised. If it’s Christmas, Birthday or whatever. Grab yours Now from the place that’s More than just a Hot Rod Shop! Armadale Auto Parts!